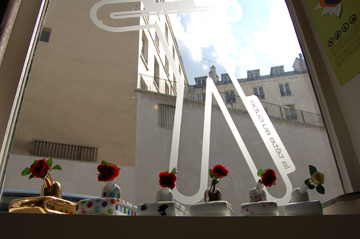 La Tête au cube (which means ‘a cube of head’ in French) has created unique objets d’art such as tank-shaped flower vases and hooks that remind us of the screws on tin robots. Ever since Jérôme Fischbach, from Strasbourg, and Thierry d’Istria, from Corsica, launched La Tête au cube in Paris in 2005, they have attracted attention and been featured in various media domestically and internationally. COOL : What inspired you to launch Le Tête au cube ? J : I was working as an organizer for sports training camps after I finished business school. But I started feeling like doing something else. 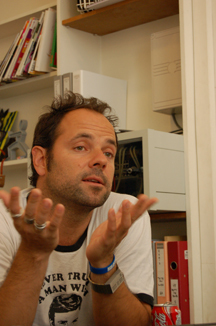 T : I worked for Philippe Strack for a few months after studying product design. Then I started my own career and worked on space designs for clubs, boutiques, as well as McDonald’s in Japan and France. We’ve been friends for 20 years, and one day we started talking about ‘creating something different’ over beers. 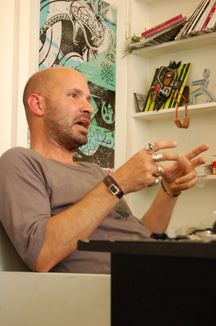 And then Jerome became the president and I became the designer of Le Tête au cube in 2005. Since we exhibited pieces at a trade fair for interior design called ‘Maison & Objet ’ in Paris on September that year, we’ve been doing well. COOL : What’s the concept of your creations? J : There is high competition in the market of designs now. We don’t create things to sell. It’s important for us to create with clear concepts. Each object that we create has its own story. T : A tank-shaped vase ‘Tank you’ is one example. After a couple fights, they make up as one of them hands this vase with flower to the other, along with the word ‘sorry.’ It’s also a symbol for ‘a cease-fire’ in a broader sense, but we made the vases with the image of intimate communications of ‘handing it to someone as a symbol of making up.’ Another example is ‘Hookey,’ a screw-shaped hook that can be installed against the wall. When we were creating this, we had an image of Hookey making the house start to move like a tin robot. We want to tell people to use their imaginations more often in their daily lives. It’s also interesting in a sense that we used France’s own porcelaine de Limoges to make a fusion of the tradition and the modern. COOL : Thierry, originally you were a space designer. Why did you start your career as an object designer? T : Because I got interested in creating actual objects from various ideas. I just wanted to create something with my spirit in it. It didn’t have to be objects. We might have different directions in the future. COOL : Are there any influential figures for you ? J : Bret Easton Ellis, an author, because he has his own sensibility and inner space. T: There are people whose views I admire. I like the lighting arts of James Turrell and photo books of Hedi Slimane, a designer for the men’s collection of Christian Dior. COOL : Do you have other private works ? T : Right now, we are working on the object which will be featured at the ‘Framenco and avant-garde’ exhibition at Museo Nacional Centro de Arte Reina Sofía in Madrid. J : Also, we are working on the project of ‘cup and saucer,’ designed by Neil Poulton, collaborating with Musée des Arts Décoratifs. COOL : Have you ever been to Japan ? J : Once, on vacation. I enjoyed shopping, and spent 8 hours at a record store (laughs). T : Twice on business, and once on vacation. When I went to Kyoto on business, my client arranged a tour guide for me on a day off. Though he explained eagerly about all the places that we went, I couldn’t communicate with him because he couldn’t speak English. I will never forget about that day (laughs). COOL : Tell us about your future plans. J : I want to create things other than objects, and collaborate with cloths and music. 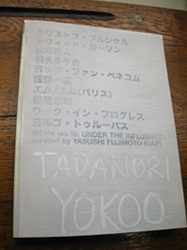 I also want to hire more designers, adopt the works of other artists, and collect what we like. T : And if we continue collecting all the stuff, naturally we may have a store in the future. Last year, Ginza Graphic Gallery (GGG) welcomed the 20th anniversary of its founding. 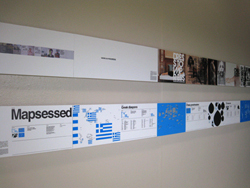 We are a gallery specializing in graphic design that was created through the help of large Japanese printing corporations that used our gallery, beginning in 1986, as a place to distribute information about art. In just about one month, GGG became well-known in Tokyo as a place that always had up-to-date information about currently active artists. 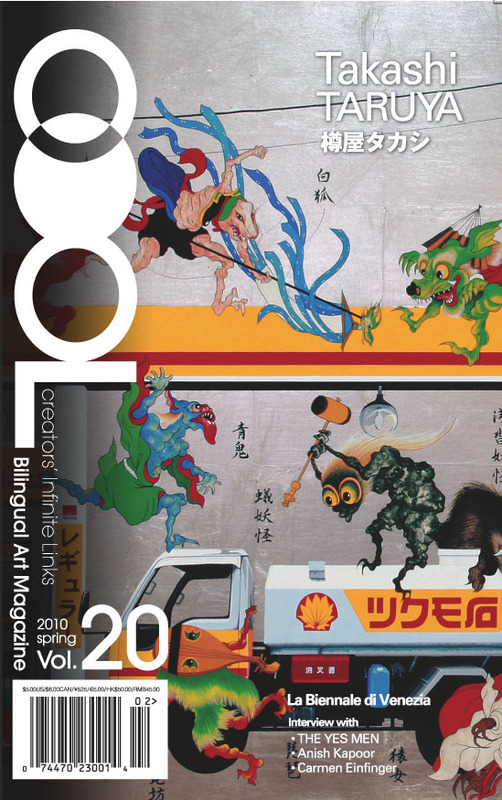 GGG held exhibitions highlighting the works of young artists, experienced graphic designers, and exhibits that displayed the works of designers from within Japan as well as outside of Japan. 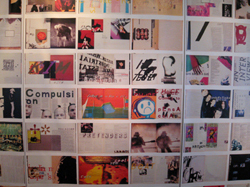 In a separate space, the editorial designs managed by these creators were displayed on the walls. The resulting feel of the gallery space quite resembled the way that art sold is on the streets of Brooklyn and Lower Manhattan. In addition to the work on the walls, there was a pool in the middle of the gallery space. Many magazines were scattered across the rippling surface of the water. Despite all the various media that has emerged from new technology and diverse cultures, there is still no other form of media that can replace the existence of the magazine. The magazine is not merely something that has bears the meaning of design. 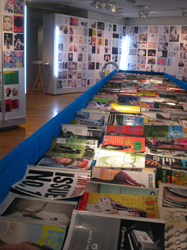 But the aspect of the magazine and the place that it holds shows the capability of design. Consequently, I think the magazine holds a separate and unique design power separate from all other media. 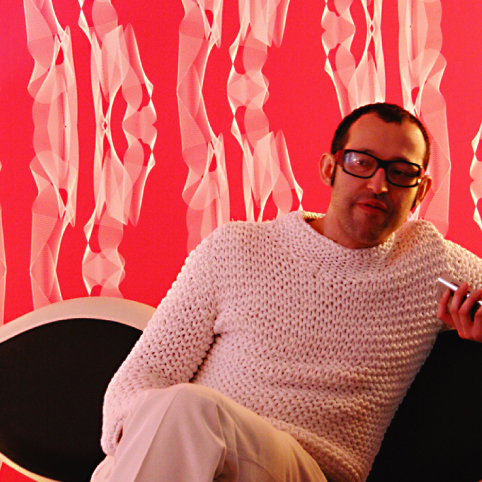 Karim Rashid, who demonstrates multiple talents in arts, music, and fashion, is a prize in the field of design. He designed at many brand labels such as Issey Miyake and Guccini. Some of his striking but cute work is featured at a number of famous museums, including MOMA. His first time in New York, he opened the Thai cuisine/ Sushi-bar restaurant, “Nooch,” last year. He designed the restaurant entirely, including the plates and the furniture. In addition to “Nooch,” he opened the designers’ goods store, “The Karim Rashid Shop.” Karim also has an art exhibition titled “I Want to Change the World”, which premiered in the beginning of this year. He has been passionately working; indeed, he entertains us with his upcoming work one after another. He is always in the center of attention. This time, I interviewed this man who does not seem to know exhaustion. COOL: Could you give us a brief profile of yourself? Karim Rashid: That's a big story. I opened my own design office 11 years ago here in NY. Before that, I worked in Canada for 8 to 9 years and I received my Masters in Italy in 20 years ago and my undergraduate degree in Canada from 1978 to 1982. I was born in Cairo, I have an English mother, an Egyptian father, and I was raised in London and Toronto. C: What made you become a designer? And when did you decide to be a designer? K: I never thought about it. It's just like I was born that way. Seriously! In my earliest years I can remember drawing objects, faces, apartments and accessories. I always thought I would be a designer. I only had questions when I was about 16 or 17 while deciding what university to go to. I did know what I should study, architecture, fashion design, interior design fine art -- Because then I didn't know about the profession of Industrial Design. I didn't know that it existed. 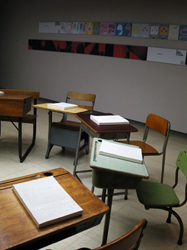 Because it wasn’t even considered a profession at the time, most people never heard of Industrial Design and very few schools taught it. I applied to study architecture at many schools and got rejection letters because I applied to late and my work was more in the area of Industrial Design. I read about what Industrial Design is and it was exactly what I wanted to do anyway. C: Do you have your own philosophy regarding design? ideology. I think my philosophy goes beyond the design. Because when we think about design we always think of contemporary, beautiful objects, things that maybe also not part of everyday life, not part of a lot of people's lives. I don't think of design this way. Also, I don't think of design as just being relegated to the physical world. So my philosophy is probably more about life in general, more about living and how to live a more fulfilling and richer life. I don't mean rich by money, but through a more rewarding life. C: How do you describe your style? we call it “style” because Expressionism is over. When a movement is active you really don't use the word “style.” So the question is more about what my sensibility, my direction and my philosophy is. I would describe it as trying to do very human things, but in a very sensual, and kind of provocative, and technological way, by marrying all of these principles and expressing humanity and real sensuality with technologies and new materials and production efforts, trying to bring all of these things together. But at the end, to do things that are just very pleasurable, bringing people a kind of heightened sense of being. Even though my degree is in Industrial Design and the majority of my work is in Industrial Design there is a side of me that is very much an artist. I think I'm sometimes torn between Industrial Design and art because I was brought up by an artist. My father was a painter. I’ve got the gene in me, my genetic make up being that of an artist, probably more artist than anything else. Being too poetic or too emotional, too sensitive -- this is not what Industrial Design is about. Industrial Design is more much about commodity, production, and engineering, so It's really difficult to walk the line between Industrial Design and art. I think my freedom afforded me to do what I do about 5 or 6 years ago, I had to be at an art show in NY and I went to one after another, and all the sudden I realized that I can wear many hats. I realized that I could now show my work in the art world. I created a lot of products for mass production, but I soon realized that I could make more creative and artistic furniture. I realized how much I enjoy Industrial Design because I am not limited to creating products in one type of category or one market. In fact, when I told you about all of the areas of design that I want to study, one of the areas that I wanted to mention is fashion design. Now I'm working on a lot of fashion accessories and things too. And there is also another area of design that I am currently working in -- I'm creating architecture. I'm doing two buildings, and a lot of interiors. I'm lucky because I am exploring a very broad range. At the same time, it’s what I wanted. I want to be broad. And I think if you want to be broad you can be. I believe what you put out into the world comes back to you. I get a lot of work from people now because they want my sensibility. Now people are interested in me making music. I also display my paintings in galleries that are interested in showing them. It's unfortunate. As a child I was one of those kids that had to do everything. It’s even worse when you are like me, a perfectionist that always had to be the best at what he did. I finished high school in two years -- I got the second highest mark in the class, and I still feel the same way (to be the best) a lot of the time. I want to be the best at everything that I do, so if I do art I want to be the best. If I do design I want to be the best designer. C: Where do you get inspiration for those unique shapes? I think about things and ideas, and memories come into my mind from being a child, from being in college, and even from things that happened yesterday. I think inspiration is very cumulative. It's a result of all of your human experiences. Let's say I have a project in which I have to design a mobile phone. I don't look at other mobile phones, but what I try to do is to think about the human condition first and of what is practical. You can get inspired by how we engage and interact with things. I am also inspired by the use of my tools (digital tools and engineering programs) and things I can do on screen. The third thing that I am inspired by are all of the materials that come into my office that we completely look forward to, which are new forms of plastics, new finishes and new materials. I was brought up in 60's and 70's when society was very utopist, and it was probably a time with the most disregard for adhering to standards in design because people were interested in changing their lives then. So being a child I was brought with this idea that one day we would be living in a utopia. That was probably a big inspiration to me, too. C: Is there any relationship between music and your design? parallel universe of design. I think it is possible for me to make a table like a piece of music. Mass production in industrial design is really interesting to me, and I really think that design is about mass production, not about art. It is possible to make a physical product that is very popular, beautiful and so well accepted and so public as music is. You can write a popular song and it touches everybody. And you can make objects in design this way. I think in design it is more difficult to do this, but you can. C: Are you thinking doing something new? What do you want to design something new from now? jewelry, watches, shoes, phones, computer, furniture, lighting, interiors, restaurants, shops, buildings, hotel, vacuum cleaners… I have passion for all of them. I'm very excited about all of them. If you have so many project to work on you forget some of them. I'm doing all plastic shoes with the company in Brasil and we just got samples in this morning. I haven't thought about the project for 3 months. I became thrilled and at the same time frustrated, because I wanted it to be better than what it was. I'm not quite satisfied by everything. I think anybody who is creative is never satisfied. Because there is no absolute notion of creativity. Creativity is abstract, so you can never really say that something is complete.